Jalapeno Chocolate Dusted Corn Nuts for sale. Buy online at Zingerman's Mail Order. Gourmet Gifts. Food Gifts. 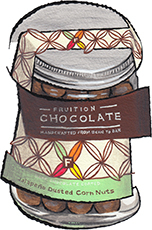 Fruition Chocolate is a bean-to-bar chocolatier in Shokan, New York. What’s a bean-to-bar chocolate company? It means they source, roast, winnow, and conch their own chocolate directly from cacao beans. Most chocolatiers in the world buy their chocolate (called couverture) from a handful of large companies, some with varying quality. Bean-to-bar companies manage everything themselves and as a result, produce chocolates and confections with flavors that are totally unique and found no where else. These corn nuts are a great example of the sort of creative wings you can spread when you do it all yourself. Jalapeno dusted corn nuts are covered in 65% dark chocolate. They’re addictive. Crunchy, a little salty, a little spicy, a little sweet, a little offbeat, and 100% delicious.